Broccolini is my favorite vegetable. I am a big fan of vegetables in general, so this is saying a lot. 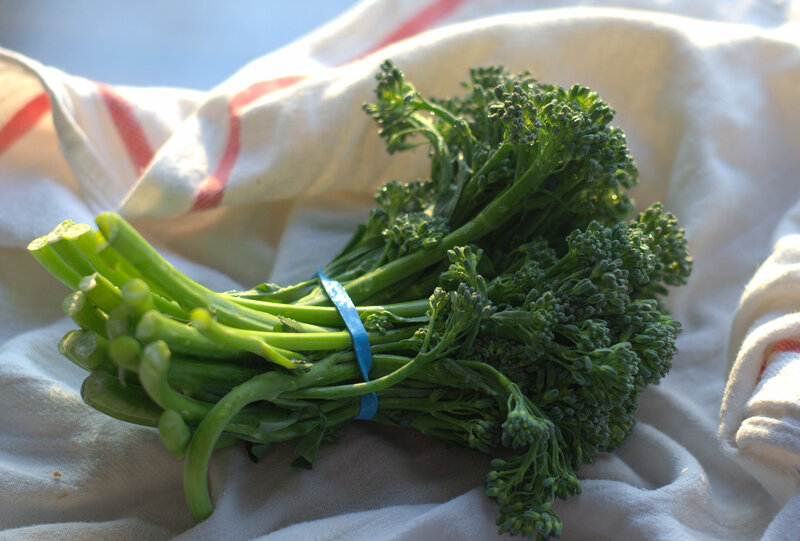 Broccolini is not, in fact, another name for broccoli rabe, nor is it simply baby broccoli. It’s a fairly recent cultivated hybrid of regular broccoli and Chinese broccoli. The vegetable has long, tender stems topped with small buds and a few dark green leaves. The entire thing is edible; just trim off the last 1/2 inch or so to make a fresh cut. The flavor is reminiscent of regular broccoli, but milder and sweeter, less cruciferous, and slightly reminiscent of asparagus.. Just a few minutes in a steamer is all that’s needed for a deliciously tender veg. 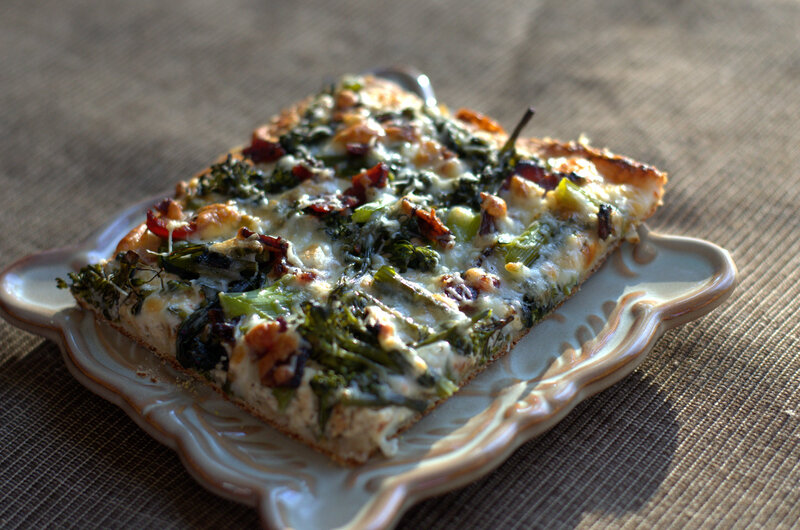 That hint of asparagus flavor made me think of our asparagus, bacon, and ricotta tart. I used pizza dough instead of puff pastry and halved the bacon to ease up on the calorie count a bit. Instead of herbs, I flavored the ricotta with caramelized onion and garlic, to play off the broccolini’s sweetness. I haven’t used store-bought ricotta since I learned how to make it at home. If you don’t have homemade (or the time to make it), you may need to boost the flavor with a little lemon juice or zest. Try shreds of prosciutto instead of the bacon, but don’t skip the ricotta; that thin layer is a creamy contrast between between the crisp crust and the crackly bacon. The relatively small amount of parm and mozzarella form a cheesy web that protects the broccolini from drying out. If your bacon is very salty, you could skip the parm and use all mozzarella. We used a local organic bacon with a modest salt content, so the parmesan added just the right amount of salinity. The cornmeal serves two purposes: it acts like minuscule ball bearings to keep the dough from sticking to the parchment, and it adds a pleasantly gritty crunch to the crust. Heat oven to 475 degrees F. Trim the last 1/2 inch off broccolini stems, and remove any leaves that are really wilted or damaged. Cut the broccolini stems in 1-inch lengths, and cut the tops in small bite-sized pieces. Pile broccolini into a steamer basket, putting stems on the bottom of the basket. Steam over boiling water for about 8 minutes until tender. Set aside to drain well. Cook bacon in a skillet over medium heat until well-browned and crisp. Remove bacon to paper towels to drain; discard most of the bacon grease. Add onion and garlic to the pan. Sauté for 5 minutes until tender and browned. Stir into the ricotta along with a pinch of salt and pepper, and the Aleppo if using. Line a large cookie sheet with parchment and sprinkle evenly with cornmeal. Spread or roll the pizza dough out to a thin rectangle and lay on the cornmeal-covered parchment. Spread the ricotta mixture evenly over the dough, close to the edges. Pat the broccolini dry with a clean kitchen towel or with paper towels, then scatter evenly over the ricotta. Crumble the bacon over the broccolini. Top with mozzarella and parmesan. Bake for about 15 minutes, until the crust is well-browned on the bottom and the cheeses are lightly browned on the top. In my own gas oven, that means I bake the pizza on the lowest rack for 10 minutes, then move it to the highest rack for another 5-8 minutes to brown the top. This entry was posted in baked goods, main courses and tagged bacon, broccolini, parmesan, pizza, ricotta, veggies. Bookmark the permalink. I love broccolini too! And this is an interesting way to use it. Thanks for sharing! Anne, I usually don’t fuss with it–just serve it steamed or sauteed in olive oil. But my family’s up for experimentation, thank goodness. what a healty and yet tasty pizza….